We have all heard it before – left brain and right brain folks don’t work well together. At DiPrete Engineering, we have found just the opposite. We use a mix of our diverse team’s knowledge and creativity to get the best possible result for each our client’s businesses. How do we do this? First, we try to understand our client’s business. We want to know the markets they work in, the people and businesses they deal with, and their overall mission. In our industry, being a competent engineer is a prerequisite; it’s the areas outside of engineering where we can make a difference. Second, under our roof we have assembled analytical folks that understand investor returns, regulations & law, finance, and lending (left brain). 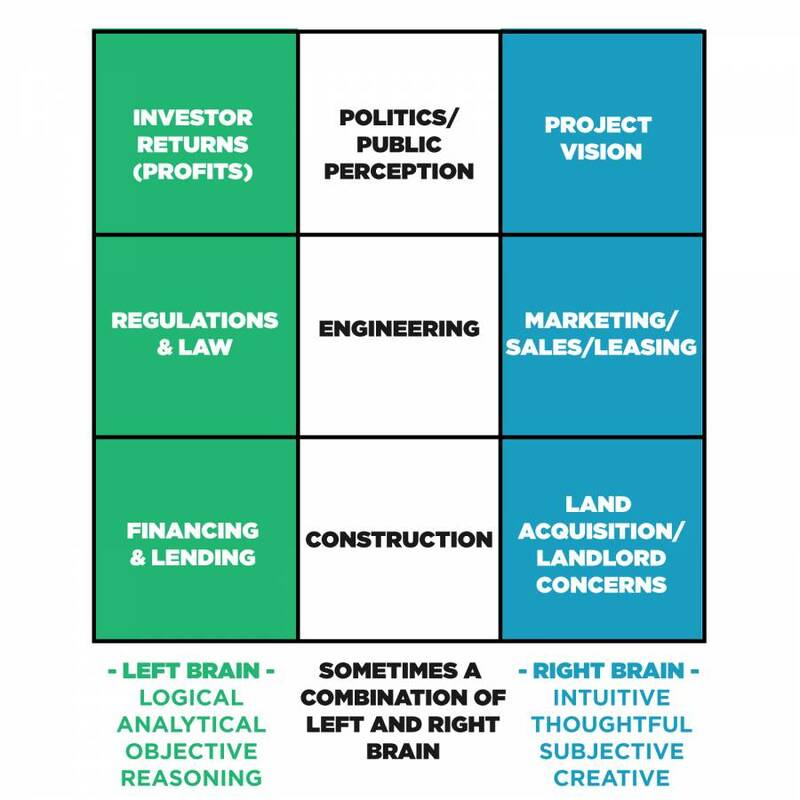 We have creative folks that recognize a project vision needs to be balanced with the acquisition, landlord concerns, and appeal to the end user (right brain). We also have staff that have a unique combination of left and right brain skills, including diving into the political climate that can make or break a deal, or how to work with contractors to balance costs and long-term maintenance. Once we can relate to the client’s world – walk in their shoes – we look for areas we can add value. Our team offers expertise where needed and develops a roadmap with our client that is creative, innovative, and positioned for success. We see ourselves as more than a consultant, we strive to be an extension of our client’s team.